"This is a very quick and cool summer salad, but it's also good year-round. Serve cold or at room temperature." Spread cucumber slices in a thin layer on a large platter. Sprinkle salt generously over the cucumber. Let salt soak into cucumber slices for about 30 minutes. Transfer cucumber to a colander and rinse with cold water; drain thoroughly and transfer to a dry surface. Pat cucumbers dry with paper towel. Whisk vinegar, olive oil, sugar, and dill together in a large bowl. 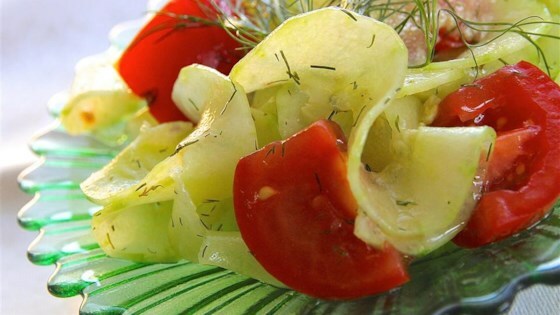 Add cucumber slices and tomatoes; toss to coat. You may skip the step of salting the cucumber if in a hurry, but it does take the bitterness out of cucumbers. Use 1 cup grape tomatoes in place of the chopped tomato if you wish. Perfect side dish for a hot summer day. I skipped salting the cucumbers and doubled the dressing (personal preference), this recipe is spot on. Love it! Used fresh dill with a dash of lemon. Used local honey in place of sugar. Quick and easy, delicious. I made it exactly like the recipe. Very good and easy to make!